← Time to Lean In? Disclosure: I received a copy of The First Christmas Night in exchange for an honest review. All opinions, as always, are 100% my own. 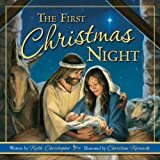 You’re all probably very familiar with the rhyme “Twas the Night Before Christmas”, but have you ever heard a version about the night before the real, first Christmas? Keith Christopher, author of “The First Christmas Night”, has brought us a beautiful poem in the style of this familiar rhyme. A beautiful telling of THE Christmas story (accompanied by illustrations in oil paintings by Christine Kornacki) brought me to tears. I haven’t read this to the kids yet (saving it for Christmas Eve around the tree), but I am sure they are going to love it just as much as I did. Even though we know the conclusion of the story, it’s still a magical, beautiful moment, making me fall deeper in love with all.the.things. And now, we that know can say with delight, Jesus was born on the first Christmas night! From the journey through Bethlehem to the visit from the Wise Men, this story is a gorgeous way to celebrate the season. You can get your own copy through Ideals Children’s Books for $16.99. This entry was posted in Book Reviews, Holiday Gift Ideas and tagged Book, Christmas, holiday, Holiday Gift Guide. Bookmark the permalink.